Security incidents continuously make our morning headlines and cause enormous damages and reputational harm to organizations worldwide. That’s why IR professionals are a crucial part of any security team. 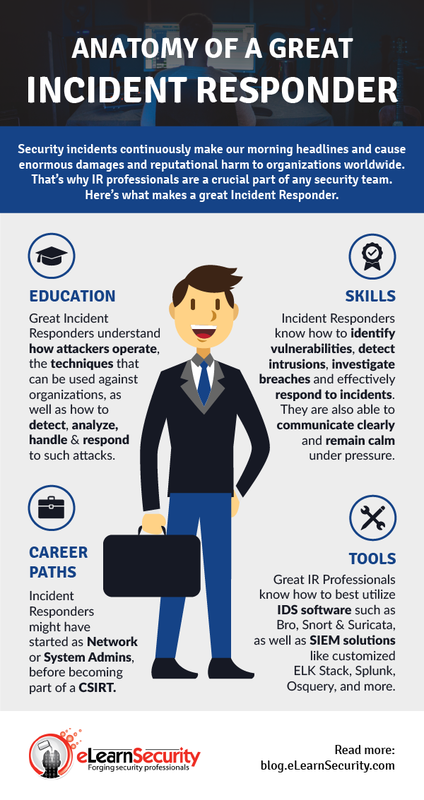 Here’s what makes a great Incident Responder. Reading from a mobile? Click on the Infographic for widescreen view. While the job of an Incident Responder is highly practical, soft skills are equally important. It’s crucial that professionals in this field be able to handle not only security incident, but also a high-pressure work environment. In addition, Incident Responders must be eager to stay up to date with the latest threats and work on their skills accordingly. It’s all about being proactive. Indeed, with now more threats created in a day than in the entire 20th century, the desire for continuous education and improvement is a MUST to succeed in this field. Interested in learning how to analyze, handle and respond to security incidents? Join us on March 26 to discover our newly launching IHRP training course and how it can help you become a better blue team member.